Since 1960, MIT Summer Day Camp has strived to offer an inclusive environment where all children are encouraged to participate and learn new skills. Our programs are designed to ensure each camper a safe and enjoyable experience. MIT hires only highly qualified individuals with tremendous experience working with children and knowledge in a broad spectrum of recreational activities. 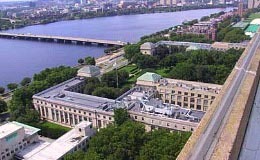 MIT Summer Day Camp is a member of the Massachusetts Camp Association. Jr. Lifeguard Red Cross Swim Lessons, Skit Show, Water Polo, Pool Carnival Fun Swim, Soccer, Floor Hockey, Swimming Tennis Agility & Balance Training, & Wiffleball . Swimming activities take place in our professionally managed aquatics center and are supervised by American Red Cross Certified Lifeguards. Swimming lessons will be taught by Certified American Red Cross Swim Instructors.